Representatives of the Netherlands Police will attend at Mullingar Equestrian Centre on Tuesday 16 April to view and purchase suitable horses – Geldings or mares, 5-9 years old, 16 hh to 17.2 hh, any colour, draught type, preferably Irish breeding. Good temperament in traffic and reasonable flat work. Horses must be pre-entered. 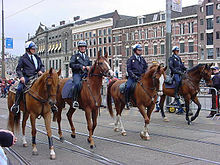 Horses must be presented ridden on the day. For any queries in relation to type of horse required please contact Annamieke 087 7880125 or Robert 086 2519161. Vetting – All selected horses will be vetted on the day. Horses valued in excess of €4500 will also be x-rayed. Sales will be subject to 6% sellers commission. Usual Conditions of Sale apply.